Ember McWilliams died in the car crash that killed her father but her little sister brought her back. The only problem is that since coming back anything living that Ember touches dies. When the mysterious Hayden shows up at Ember’s school the careful post-accident world that Ember has created falls apart and she finds her and her sister at the mercy of Hayden’s adopted father a man she isn’t sure she can trust. 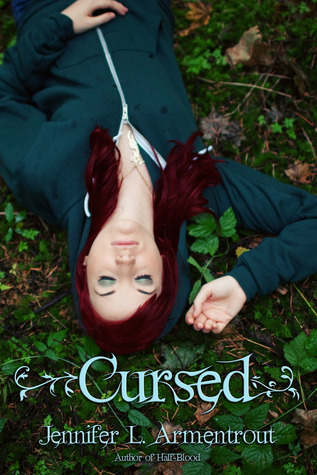 Initially I liked Cursed it reminded me a little of Shatter Me (without the poetic prose) and I wondered how Ember was going to overcome her curse. When things took a turn for the X-Men and Ember and her sister are moved to Hayden’s father’s mansion, along with other ‘gifted’ teens, I steadily began losing interest. It felt like something I had read before and I didn’t like how passive Ember was. I also wasn’t very keen on Hayden. He is Ember’s love interest and we are expected to swoon for him but he was so back and forth, hot and cold, that I just wanted Ember to blow him off. But seeing as how he is the only person Ember could touch I felt like she was kind of stuck with him. Overall, Cursed was a middle of the road read. The writing was okay, the characters were okay, the plot was just okay. It didn’t stand out and that was really the downfall of Cursed. U Can't Touch This - MC Hammer - Because, you know, Ember can't touch stuff.